You won’t fool non-vegans with this, but if you’re used to nutritional yeast “cheese” sauces, you’ll love this soy-free dish. Cook macaroni in a pot of boiling water, according to package directions. While it is cooking, combine the remaining ingredients (except paprika) in food processor or blender. Blend until very smooth and creamy. 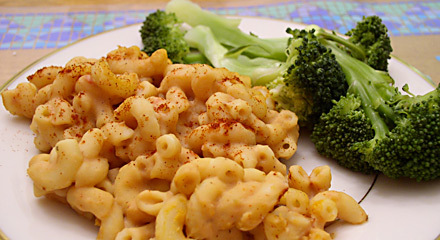 Combine macaroni and sauce in a oiled or sprayed baking dish. Sprinkle lightly with paprika and bake in oven until bubbly, about 15-20 minutes. *The tahini adds fat but increases the creaminess and cheesiness. NOTE: Different styles of canned tomatoes give this dish different flavors. For a spicier recipe, use tomatoes with jalapenos. For a very spicy dish, use salsa instead of diced tomatoes. Sauce based on the Nacho Cheez sauce in this recipe. Nutrition (per serving, without tahini): 251 calories, 12 calories from fat, 1.5g total fat, 0mg cholesterol, 398.9mg sodium, 359.8mg potassium, 46.2g carbohydrates, 4.7g fiber, 1.7g sugar, 15g protein, 4.4 points. One tablespoon of tahini adds 15 calories and about 1 gram of fat per serving. This looks so good. I’ve been craving cheese for months. But I have IBS, and can’t eat tomatoes or bell pepper or anything like that. Any ideas for a sub? Is it ok to freeze this? This was my first time using nutritional yeast and unsure if you can freeze after preparing. thx! great recipe! I’ve made this several times and it’s very good considering it doesn’t have real cheese. I just made this for dinner last night. It was delicious! Even my toddler loved it! Thanks for giving me a healthy alternative to make my kids! I made this a couple weeks ago, using fire roasted diced tomatoes with green chilis. We liked it quite a bit and I wouldn’t hesitate to make it again. This isn’t really one of my favorites, either. I haven’t made it in years since I developed my Easy Mac and Cheeze. Hmm.. I just made this just now.. it is really not a good recipe.. unfortunately..there is no sauce after it is cooked, it just all dries up, no creaminess at all.. it is just like eating dried out macaroni with a little tad of flavor from the spices.. So I went ahead and tried again.. and this time doubled the sauce batch, and still the same.. I would love to go on this plane of eating. What do I do first. Question, I stumbled upon your site due to being dairy free (lactose intolerant). LOVE what I see, however, I have a very hard time digesting most whole grains, IE: whole wheat, barley, etc.. I can do oatmeal, brown rice, and corn meal (in small quantities). So, my question is…. How does nutritional yeast rank w/ whole grains? I make this recipe quite often. Love it, but when it says put in oven until bubbly, mine is never bubbly. Matter of a fact the cheese sauce it thick. I use salsa instead of tomatoes, but I still have to use more than called for. We have just gone to eating this without baking it. It is still good that way. My husband asks for this at least every other week. I made it to great acclaim, with the salsa; finished it last night, and enjoyed it cold. Thanks Susan for another. That’s a tough one! I rely probably too much on my appliances. You can probably blend sauces with a whisk and a strong arm, and for nuts, I guess a good sharp knife would work. I wish I had a better answer for you! I’ve made many of your recipes before, and always been impressed. This, however, was really disappointing. I made it for 5 of us and everybody’s first reaction was unpleasant. They claimed to get used to it as they persevered, but honestly it was just rather odd tasting. We’re certainly all used to healthy, vegan food, and all the ingredients were familiar to us. I don’t know what went wrong. Everyone else seems to have had success with it. I’m sure I followed the recipe to the T. I made double the amount, however, so I simply double all the ingredients…is this perhaps were I went wrong? Help! @kristy yer yer its the same thing. Hi I’m totally knew to this lifestyle eating change, actually still in the fruit and juice detox phase. I saw this film, ‘fat, sick and nearly dead’ and I want to change my life and I know that what I put in my life has a lot to do with that. I come from an large meat/sugar/starch eating family and many illnesses has come from that. I would like that to change and it’s been a work in progress for years and I need some heavy duty recipes and support. This site looks like it will be a big help. What is nutritional yeast? Is it the same as yeast flakes? Susan! Oh and I’ve made this with spicy tomatoes too – YUMM!!! Anyone who hasn’t made this yet is missing out! I made this last night using the salsa variation and it was delicious! I agree with the 3-4 portions, not six. Just made this for the first time, and it was epic. You must eat very small portions though, i’d say this serves three rather than six! Or am i just greedy? Very delicious and healthy. I’ll try this as soon as possible. I ate something like this, but macaroni was spread with bread crumbs and baked in a oiled dish. How much is 350f in gasmarks? Cheryle, I haven’t heard of that recipe. This recipe is mine, based on the one linked to in the recipe. Great Northern Beans are a type of white bean. You can substitute navy beans or any other white bean. I would like to know if this mac n’ cheese recipe is from the Chef for the NY Times? Have you heard about it.? Where is recipe? I am preparing this right now! raw the sauce taste so good!!! I might try this this weekend!